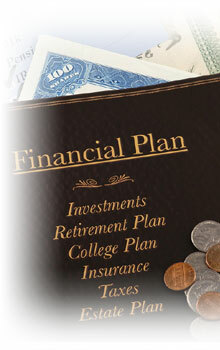 Financial planning is the process of establishing personal and financial goals and creating a way to reach them. The ongoing process involves taking stock of all your existing resources, developing a plan to utilize them, and systematically implementing the plan in order to achieve your short and long-term goals. The plan must be monitored and reviewed periodically so that adjustments can be made, if necessary, to assure that it continues to move toward your financial goals. One element of financial planning is investment planning. The number and variety of investment vehicles are ever changing, and numerous factors such as inflation, interest rates, government regulation, tax laws, and economic indicators also affect investment planning decisions. Fortunately, there are some well-founded investment planning concepts on which you can build a logical, although not foolproof, approach to the investment planning. While we do not recommend specific investments we can assist you in deciding those best suited to you. In addition we can assist you in reviewing such things and insurance and risk management, estate and tax planning and cash management and budgeting, among others.